One of the most evolving and interesting industry is the food industry. Everyone loves food and trying different varieties and new inventions have been the new trend. Chefs and food experts all over the world have been trying new combinations to see what works and what does not. They have been introducing new recipes with interesting ingredients to attract more customers. Every country has its special foods that the natives love to eat, but inventing something out of the box has been the new trend in the food industry. The latest food trend that has been the talk of the town is cannabis infused foods. Cannabis has been recently legalized in many United States and Canada for recreational and medical purposes. Cannabis which is known by many different names like marijuana, weed or pot is a psychoactive drug which alters the state of mind. Cannabis is a plant which has many different chemical compounds. THC is the main compound responsible for the mind altering effect. Recent researches and studies have shown that another chemical compound known as cannabidiol or CBD found in cannabis is extremely beneficial in treating different diseases. This study has caught the attention of a lot of people. Marijuana drug ranks highest on the list of drugs smuggled or trafficked over borders. Marijuana was previously legalized for medical purposes only but now the United States of America, Canada, and South Africa among other countries have also lifted the ban and legalized it for recreational use as well. This has allowed a lot of food enthusiasts to experiment with cannabis and include it in recipes giving it a new kick. Which countries produce cannabis? Cannabis is grown all over the world. It originated in the Central Asia, but people all over the world have been familiar with it since very long. Marijuana is grown and cultivated worldwide. It is used through smoking, vaporizing, and now in foods as an ingredient as well. Among smoking and vaporizing, ingesting cannabis is considered a safer means to use marijuana. Ingesting it takes longer to show the effects of the drug, usually about 30 to 60 minutes. There are several food products that are infused with cannabis extracts. Cannabis is also being infused in drinks. What happens when you ingest cannabis? The hemp plant contains a lot of chemical compounds, but the one compound that triggers the effects of the drug is THC. THC is responsible for the effects like increased heart rate, euphoria, increased appetite, fatigue and anxiety. The reason why people are so keen to try out marijuana (if they haven’t had it before) or continue taking it is the relaxation it provides. The drug relaxes both the mind and muscles of the body. People looking to get high usually use food products that are THC dominant. Some food businesses market their cannabis infused products with the benefits of cannabidiol or CBD (a chemical compound that is said to be beneficial in treating various diseases). These food products mostly contain higher amounts of cannabidiol. Another name for foods that contain the non-psychoactive cannabis is hemp foods. Cannabis infused food items are trending in several countries. Lets have a look at Why CBDy infused foods are gaining popularity? Food industry and businesses are constantly in search of new innovative ideas that are lucrative and attract the attention of the customers. A frozen yogurt shop in London named Yogland has introduced a new and unique flavor in the fro-yo land after the recent legalization of CBD oil in the United Kingdom. It is the first ever frozen yogurt shop that has infused cannabis in frozen yogurt. This shop in west London serves vegan frozen yogurt with hemp as an ingredient. 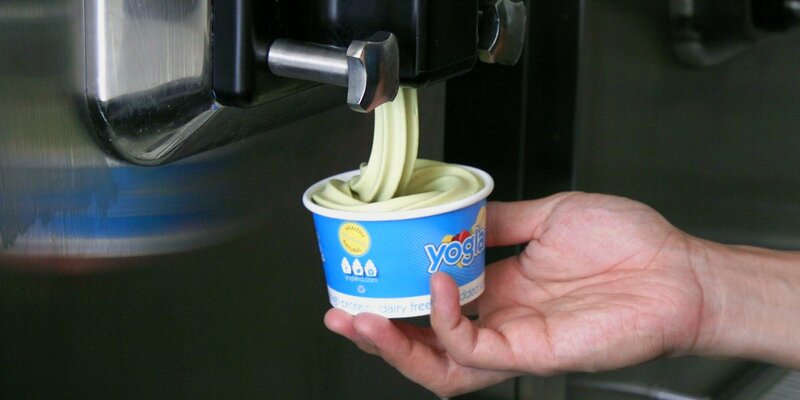 The special flavor is a combination of hemp and matcha tea flavor known as the Hemp Matcha. It is infused with CBD and contains about 40 percent CBD oil. CBD is a non-psychoactive compound of the hemp plant which means that it does have any mind altering effects attached to it. Yogland is known for its healthy frozen yogurts. It claims that their new hemp matcha flavor provides many health benefits which come from the CBD oils infused in the frozen yogurt. Another popular food item containing cannabis that is gaining popularity around the world is coffee. There are a few coffee shops that serve coffee with cannabis extract. One such coffee shop is Blooms Café in Waterford. This coffee shop serves coffee infused with cannabis having high CBD levels and low THC. Customers can choose their regular coffee and add hemp to it. This provides stress relief and relaxing effect. A café in Tempe, Arizona has a wide range of cannabis foods for people who are allowed to take marijuana due to medical purposes in a limited amount. This café serves all kinds of foods and the chef treats cannabis as just another ingredient. They serve foods like baklava, chocolate croissant, banana cake, carrot cake, chocolate cake, raspberry pot tart, and brownies and many more. 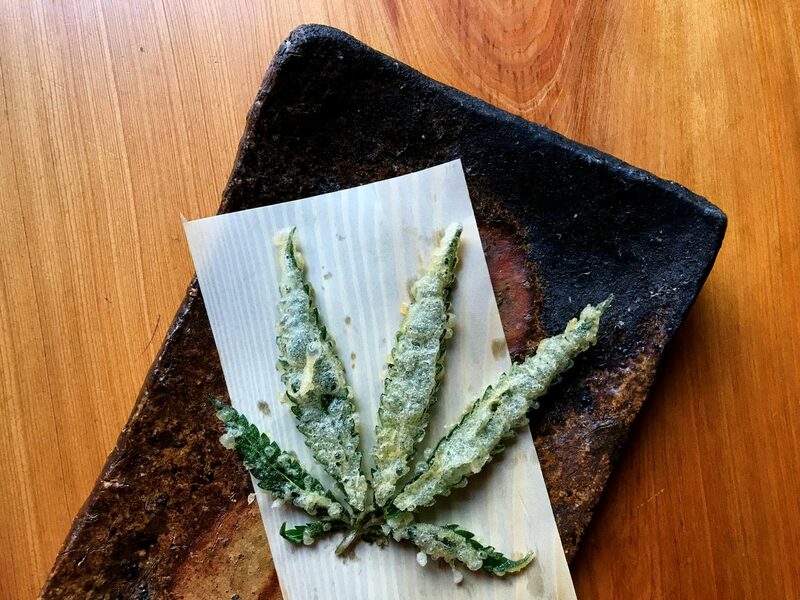 A restaurant in Los Angeles named Shibumi serves deep fried marijuana leaves. The marijuana leaves used are five weeks old. During these five weeks the THC compound fades away leaving only the healing compound of the plant called cannabinoid. The marijuana leaves are dipped in batter and then deep fried until they are crisp. They are then topped with CBD salt to finish it off. The fried leaf gives the taste of marijuana but does not give off the smell of weed. The taste is subtle and the tempura is very light. The restaurant Shibumi in Los Angeles also serves cannabis infused kimchi. It is prepared in-house and infused with chopped marijuana leaves. Kimchi is a dish which is made by fermenting cabbage with salt. It is a staple as a side dish in Korean cuisine. The restaurant tosses marijuana leaves in the cabbage leaves which are then set aside to ferment and develop flavor. Cannabis is being infused, topped, and sprinkled on almost everything chefs can think of. A shop in Aurora, Colorado serves doughnuts glazed with a special laze which is infused with CBD. 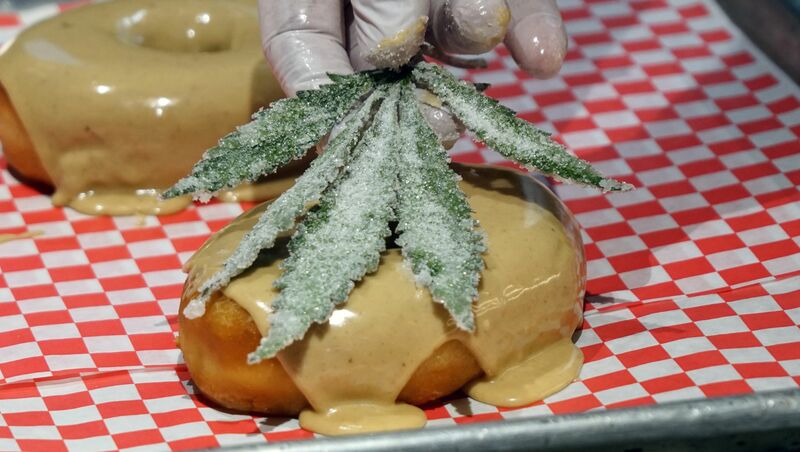 The frosted doughnut is then topped with a whole candied hemp leaf. The doughnut does not contain any trace of the psychoactive compound but has high levels of CBD in it. CBD has a calming effect which relaxes the mind without having any symptoms linked to psychosis. The Cereal Box restaurant in Colorado allows its customers to make any cereal, milkshake or coffee infused with CBD. The customers can add CBD powder to any of their milkshake or coffee and in cereals as well. This addition will not get them high but will definitely provide relaxation and take off the stress. Another popular food item is olive oil infused with CBD. Customers can directly buy it and can be used for various purposes in cooking. Olive oil infused with CBD can be used in making meals and also as a dressing for salads. Restaurants having CBD infused dishes on their menu also use CBD infused olive oils as a dressing to various dishes. Most food items that contain cannabis have cannabinoids, the non-psychoactive compound in it. Countries have legalized the use of marijuana for recreational purposes which have given food enthusiasts to experiment with it as an ingredient. This trend is said to further evolve in the year 2019.